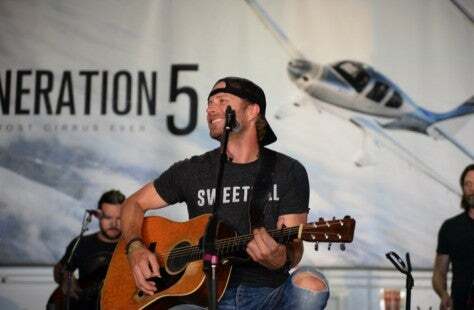 Cirrus Aircraft is thrilled to announce that country music superstar and fellow Cirrus pilot Dierks Bentley will be playing the opening night concert at EAA’s 2015 AirVenture in Oshkosh, WI on July 20. This concert will be a part of his 2015 SOUNDS OF SUMMER TOUR that kicks off on June 5. Presented by Ford Motor Company with additional support from Cirrus Aircraft, the Monday evening show is free to AirVenture attendees and will take place following the afternoon air show. Dierks is an American Country Music (ACM) top male performer nominee who embodies the Cirrus Life to the fullest. Flying his Cirrus to and from concerts while on tour allows him to do more at home and in the studio. Dierks is currently on his seventh album in his amazing country music career that began only 12 years ago. His latest album, RISER, is already a No. 1 seller that has sparked two consecutive No. 1 hits with “I Hold On” and “Drunk On A Plane.” His previous albums were also major successes, selling more than five million copies, receiving 12 chart-topping singles and earning 12 Grammy nominations. Dierks is also the most nominated male artist for the upcoming ACM Awards with seven nominations including Single Record of the Year for “Drunk On A Plane,” Vocal Event of the Year for “The South,” Video of the Year for “Drunk On A Plane,” Song of the Year for “I Hold On,” Album of the Year for “RISER” and Male Vocalist of the Year. Don’t miss out on the aviation event of the year. Mark your calendar for Oshkosh 2015 and enjoy the sounds of summer! The 63rd annual EAA AirVenture will be held July 20-26 at Wittman Regional Airport in Oshkosh, Wisconsin. For more information about AirVenture, visit eaa.org/airventure. © 2019 Cirrus Design Corporation d/b/a Cirrus Aircraft. All Rights Reserved.